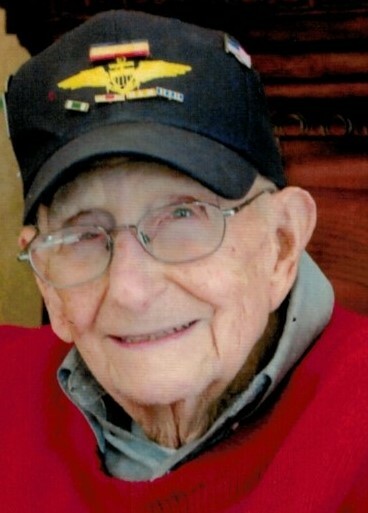 Wade E. Davis, 97, of Boonville passed away on March 18, 2019. Visitation for Wade will be held Friday, March 22, 2019 at Howard Funeral Home in Boonville from 6:00 – 8:00 p.m. Services will be held in Boonville on Saturday, March 23, 2019 at the Nelson Memorial Methodist Church at 11:00 a.m. Burial to follow at Walnut Grove Cemetery in Boonville. Wade, the son of Ellis and Lola Davis, was born August 11, 1921 in Boonville. He graduated from Boonville High School in 1939. After graduation he attended Kemper Military School, and following the bombing of Pearl Harbor in March 1942, he enlisted in the U.S. Navy. He was commissioned and received his pilot wings at Pensacola Naval Air Station and joined the USS Kitkunbay Air Craft Carrier, part of Halsey’s 3rd Fleet in the Pacific Theater. Following the end of the war he returned to Boonville to operate the family farm operation and the Western Auto Store. He met his wife Gwyneth Burton of Sedalia, and they were married on September 9, 1948. Wade served as the public administrator for Cooper County for 23 years and also operated a real estate brokerage firm. He was the past commander of the Boonville VFW Post and was a member for 50 years of the VFW and the American Legion. He was also a member of numerous civic organizations, including; chairman of the Boonville Board of Public Works, chair of Cooper County Extension Council, Boonville Chamber of Commerce Board, Boonville Airport Board, member of Masonic Lodge and Ararat Shrine Club for over 60 years, served as vice president of the Walnut Grove Cemetery Assn., and chaired the Nelson Memorial Methodist Church Administrative Board and Trustees. Having season tickets for over 70 years, Wade was an avid fan of Mizzou Football. He also enjoyed watching Cardinal Baseball as well as spending time with his family and friends at his summer home at the Lake of the Ozarks. Wade was preceded in death by his wife Gwyneth on May 19, 2012. He is survived by his daughter Debby (Jack) Langley of Columbia and his son Bruce (Mary) Davis of Columbia, grandchildren Trevor (Becky) Davis of Kansas City and Austin Davis of Columbia. Memorial contributions can be made to Walnut Grove Cemetery, Shriners Children Hospital or Nelson Memorial Methodist Church. Online condolences may be left at www.howardfh.com.